For nearly twenty years, I've collected some strange fossils from a unique Pennsylvanian deposit in northeast Kansas. I've been pondering them to this day, and I'm still drawing a blank. The bold segments caught my eye. I then noticed that they have a branching habit. This one is also segmented and bifurcated, but it forms a nearly continuous surface. Perplexed, I looked at them up close. They seem to form thin (0.5 mm), leaf-like sheets (i.e. thalli). I nicknamed these 'pahoeids', because they resemble pahoehoe lava flows. This chunk demonstrates how the 'pahoeids' bind the sediment. They are so abundant, they actually form beds and lenses of limestone within a shaly matrix. The few 'pahoeids' I've found in situ were on the undersides of slabs. The top surfaces of the organisms are never cleanly exposed; they are always locked in matrix. Also, encrusting bryozoans and brachiopods are often attached to the surface. All of this tells me the 'pahoeid' thalli were once suspended above the substrate. Note how the orangish sediment seems to 'fill' the little 'cups'. As to the nature of 'pahoeids', the only thing I can think of is some form of red algae, perhaps similar to present-day Mesophyllum or Peyssonnelia. It's possible they could be something akin to the Pennsylvanian Archaeolithophyllum. So far, I've been unable to discern any fine internal structure. If they indeed are phylloid algae, this will be the only example I know of where they are preserved in shale, let alone left with readily observable morphology. For the sake of this post, I'm lumping all these thalli forms together as 'pahoeids'. They very well may represent a number of different organisms. Going by the lithology, I've guessed that the 'pahoeids' lie in the Frisbie Limestone (which is, stratigraphically, a transgressive limestone). As far as I know, the beds could, instead, belong to the upper Liberty Memorial Shale. The 'pahoeid' beds are a complex bundle of shale and impure limestone beds and lenses. At the top, there is limestone made up of fine fossil debris. There is pyrite and glauconite present througout the unit. Below the Frisbie is the Liberty Memorial Formation, which is a typical shallow marine/non-marine shale. It is medium gray, sandy, and contains thin beds of sandstone in places. Trace fossils, including Conostichus, are present. Above the 'pahoeid' beds is the Quindaro, a deeper-water shale. Fossils include profusely abundant sponges (Heliospongia ramosa, Maeandrostia, and especially Fissispongia), as well as some small crinoids, bryozoans, and brachiopods. The thick limestone above the Quindaro appears to be typical Argentine (which is regressive, for those taking notes ), but the strata in the area are anything but routine. These sponge-'pahoeid' deposits are near the edge of a large algal reef build-up in the Wyandotte Formation. Less than a half mile away in either direction, fossils at this horizon are sparse to absent. I should mention that all of them are calcified. You said "Some appear to be featureless sheets"
I have seen many such examples of what initially appeared to be "featureless sheets"
in the shale at my Pennsylvanian research locality here in St. Louis. Dont know if my expertise is of any merit on the topic, but I have seen like features in marine deposits of the Sundace Fm. of Wyoming. My interpretation was they were trace ichnofacies, perhaps a reworking by an anilid, mollusk or the like. However there may have been algal mats that compositionally changed their substrate, not so much as stromatolite would have.... Think thinner, leaching mineral content from the substrate leaving a distinctive foot print, then being so weak that decomposition erases any relateable material. Some of my thoughts exactly, Mr .Scaphite (I just couldn't organize them into a coherent idea). Green arrows point to tiny brachiopods, probably Leptalosia. 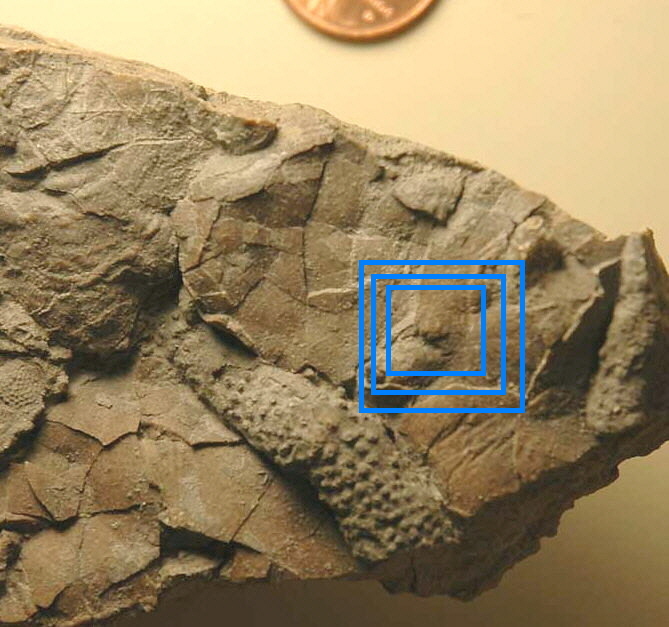 The blue arrows points to the bryozoan Fistulipora. The ones I've found in place were face down. But then how would encrusting brachs and bryozoans end up on them? The only thing I can think of is that they were once upright, or were suspended just above the sea floor like low plants as the little encrusters lived a sheltered life on the undersides of the thalli. These are a first-class mystery, for sure! D'oh.... I forgot to mention that there are many Chondrites-like burrows that run through the mud between the 'pahoeids'. Some can be seen as holes on the sides of beds. The ones shown above all have little holes in them. I have others that are exposed on bedding surfaces. I'll try to get photos of some when I have the chance. 4. which provided a surface for little critters to attach to. 5. Eventually, sediment covers and compresses the fossils. Encrusting algae is quite prevalent in these beds. The sponges are often covered with the stuff. Fascinating... I would think if they were just traces there would be no thickness to the fossil in cross-section as you see in pics 10 and 11, assuming these are the same thing as the ripply structures you see on a flat surface.. right? Right. All specimens shown are 'body' fossils. In the first image, at the top center of the slab, there is one ripply structure that is raised a bit above the rest and is broken off. I have a hard time visualizing how a trace could be preserved like that unless it was lined with calc algae. In the 'long, parallel' specimen, you can see where the calcite membrane has weathered off, exposing the lighter matrix beneath. I think I see it. My uneducated guess is you've got some kind of algae, tho I know that's not very helpful. Very cool specimens anyway, I have seen nothing like them. Unfortunately, I haven't yet found any in situ. Depending on the orientation, they could be something akin to algal mounds, or they could be filled burrows. They kind of remind me of spreiten of trace fossils, the concentric grooves or tubes formed as an organism systematically grazes, but I have never seen any quite like that. The last pic in the original post definitely looks like there are some phylloid algae fragments in there. cool sample, is right at the contact? If so what does the top of the underlying unit look like? I have also seen some trilobite ichnofacies in the Deadwood Fm. in SD and WY that have a similar look. Mind you I am just taking shots in the dark. The trilo tracks due to the reworking of material sometimes are better indurated then the surrounding matrix. However it would take lots of trilobites to make what I see in the images. Perhaps it is some other filter feeder critter? I do however stand my my algal/microbial mat hypothesis. Particularly due to the lack of further physical evidence. Thank you Missourian for so nicely illustrating what I was getting at. The last pic in the original post definitely looks like there are some phylloid algae fragments in there. cool sample, is right at the contact? If so what does the top of the underlying unit look like? Do you mean the underlying unit of the rock in the last pic, or beneath the thalli in general? The contacts below all specimens are shale, which range from feather-edge to thin. This is what allows the 'pahoeids' to become exposed in the first place. As you can imagine, the shale had disintegrated by the time I found them.